Wormholes - just theoretical or a gateway to another universe? Wormholes - just theoretical or gateways to another universe? The term "wormhole" was first coined by American physicist John Archibald Wheeler in 1957. Before that, this phenomenon was known as an Einstein Rosen Bridge. It was as far back as 1935 that physicists Albert Einstien and Nathan Rosen used general relativity to suggest the possibility of "bridges" through space and time, creating a short cut, thus enabling travel over great distances very quickly. Trouble is, we're now into the 21st century and one of these bridges has yet to be discovered. Here we see how a wormhole would work, with space-time represented as a two-dimensional sheet. 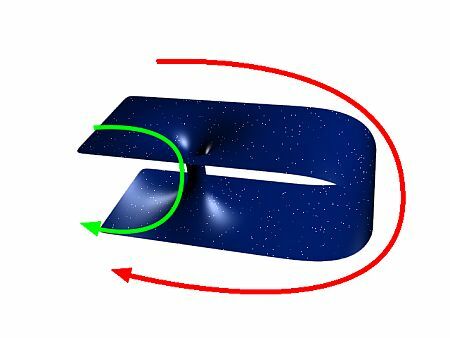 If the sheet is folded over, as shown, a bridge would provide a short cut through higher dimensions (the green arrow), traversing the distance much faster than passing through conventional space-time (the red arrow). So, Are They Just Theoretical? Just because one hasn't yet been discovered, does this necessarily mean that they only exist in theory? It has been postulated that, at the quantum foam level - that is, the most fundamental level of the Universe - there are tiny wormholes continuously popping in and out of existence. Not much use for humans or spaceships, though. Could they be bigger - and more stable? Hang on - held open by what? I'm afraid the weirdness factor of this page is about to increase. Cosmic strings (not to be confused with the "strings" in String Theory) are theoretical fault lines in the fabric of the Universe. Believed to have possibly formed as the Universe began to cool down after the Big Bang, they can be likened to cracks in space-time. Yes, it really seems like we've entered the realm of science fiction, doesn't it? These strings are defined as having only one dimension - length - and being extremely dense. To give you some idea of how dense, one of these strings only one mile long would be heavier than Earth. They could exist running in a perfectly straight line right across the length of the observable Universe, or form gigantic rings, many times larger than our Galaxy. In 2005, a team of astronomers at the University of Liege in Belgium were studying a group of 355 quasars. Each quasar gives off a powerful jet of energy in one particular direction and it was reasonable to expect these directions to be totally random. What they found, however, was that a great number of them had jets pointing the same way. In fact, when they looked at ever more distant quasars, the jets formed into a huge ring. The only thing that could cause that, they thought, was a cosmic string. This was considered tentative proof of their existence. However, such a string could hold open a wormhole - only if it had negative energy. Oh, what now - negative energy?? One of the situations arising from quantum physics is that a region of space can contain less than nothing. Yes, you read that right. But how can that be? Let's say we have a vacuum - a volume containing nothing at all - which has zero energy density. At the quantum level, this volume still contains a mass of "virtual" particles, constantly popping in and out of existence. In other words, the vacuum constantly fluctuates. If these fluctuations could be dampened in some way, the vacuum would then display less than zero energy - negative energy. Using negative energy is the only way a spaceship-sized wormhole could be kept open. This is a term used in quantum mechanics to describe a very peculiar property displayed by pairs of subatomic particles that are "entangled". Let's say one particle is positively charged and the other negatively. If the positive one's charge is changed to negative, then the other will instantly change its charge to positive. The amazing thing is, this happens whether the particles are side by side or at either end of the observable Universe. No-one knows why, or indeed how, this can be possible. An important quantum rule, however, is that an individual particle cannot be entangled with two things at once - it has been termed "monogamous". Now, when we consider entanglement in relation to black holes, problems begin to emerge. It is now known that black holes emit photons of energy called Hawking radiation (after, of course, Stephen Hawking, who predicted its existence). Trouble is, these photons would appear to be both entangled with themselves and with the interior of the black hole - which violates quantum monogamy. Two physicists, Juan Maldacena and Leonard Susskind, from the Institute of Advanced Study in Princeton and Stanford University California respectively, have made an audacious proposal to solve this paradox. They suggest that two black holes could be entangled, thus releasing the Hawking radiation to be quantum monogamous. The entanglement of the black holes could be physically manifested...as a wormhole. To spot a black hole that might be harbouring a bridge to another, it would be best to observe a really large one that was quite close to us, astronomically speaking. This is the name given to an extremely strong radio source at the centre of our Galaxy that is generally considered to be a super-massive black hole. It is a prime target to study in relation to the possibility of its being a wormhole. Physicist Cosimo Bambi, of Fudan University in Shanghai, China, has remarked that black holes and wormholes are virtually indistinguishable. But he maintains that there is a way to test which one they are. Both types of object cast "shadows" in the form of regions of darkness surrounded by bright halos. The wormhole shadow would be far smaller than that of a black hole, with the bright area much larger. Bambi states that it would be quite easy to check Sagittarius A* for this and some telescope projects are being lined up to do just that. We could be within years of discovering our first gateway to who-knows-where! It's the general consensus that, if you fall into a black hole, you'll be crushed to death by the intense gravity. So, how could one be a wormhole gateway? Now, I need to tell you about something called "loop quantum gravity" (LQG). It is a theory that attempts to merge quantum mechanics and standard general relativity. Before this becomes too mind-boggling, let me just say that the theory maintains that space itself has an atomic structure, just like matter. It's made up of interconnected loops, called "spin networks", existing at the Planck scale, which is way way smaller than an electron. Two physicists, Jorge Pullin and Rodolfo Gambini, tried applying LQG to a typical model of a black hole. They found that, at first, gravity increased, but then, instead of there being a singularity (the hole's infinitely dense centre), gravity began to decrease as if you've emerged from the "other side". As for where this "other side" will be, it could transport you to some faraway place in our Universe - or even to a different universe altogether. All well and good, but would you want to test it by entering a real black hole? The LQG version of a black hole is tempting to accept, though, because it solves the "information loss problem". Black holes swallow up everything, including information (we're not talking about the sort of information you hear on the news, for example, but physical information at the subatomic level). As the black hole eventually will evaporate, that information will be lost forever, which violates quantum theory. With the removal of the black hole singularity, this does not happen - the information simply ends up somewhere else. As Pullin himself put it: "The information doesn't disappear, it leaks out".